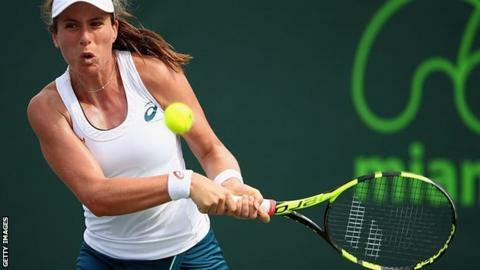 British number one Johanna Konta was beaten in the Miami Open quarter-finals by an in-form Victoria Azarenka. Konta, the first British woman to reach the last eight of the tournament, was beaten 6-4 6-2 by her Belarusian opponent in just over 90 minutes. World number eight Azarenka, 26, is on course for back-to-back titles after beating Serena Williams in Indian Wells earlier this month. World number 23 Konta, 24, failed to convert any of her five break points. The Briton, making her debut in Miami, would have broken into the world top 20 had she reached the final. Azarenka, who won the tournament in 2009 and 2011, made just 14 unforced errors in 119 points. She will next face either second-seeded German Angelique Kerber or American world number 22 Madison Keys. Konta had made more winners and fewer unforced errors after an hour's play in blustery conditions, against an agitated Azarenka. However, the Belarusian saved her best tennis to fend off five break points, while Konta double-faulted twice to drop serve. "I do believe the few chances that I was able to create, she did an incredible job," Konta told BBC Sport. "I think maybe bar one, when I felt I could have maybe made a return - I think she really did win every single point. "She definitely kept her claws in there and she took it way from me." The British number one, who was ranked 151st in the world this time last year, was playing in the quarter-finals of a WTA Premier event for the first time. "I'm happy with the level I was able to bring to the court," she added. "Obviously I'm disappointed that I couldn't have done a little bit better but I'm taking the positives from it." Wednesday's defeat brought an end to another impressive week for Konta. She is in line to move up to 21st in the world rankings, and will next head to Stuttgart for the clay-court season. "I maintain that I don't have a favourite but I really enjoy the changes that come when we go from surface to surface," said Konta. Having really begun her charge up the rankings last June, Konta has plenty of opportunity to gather ranking points before the return to grass courts in the UK. "Honestly I'm not looking at that," she said. "I'm very happy with the level I was able to produce almost day in, day out here. I'll just try to just reapply that to the next practice I have, and also the next matches I have."